The Battle of the Plains of Abraham was a pivotal battle in the North American theatre of the Seven Years' War, known in the United States as the French and Indian War. The confrontation between elements of the British Army, Royal Navy and the French Army was fought on a plateau just outside and to the west of the walls of Quebec City, the capital of New France, on the land of Abraham Martin dit L'Écossais. The battle involved fewer than 10,000 troops in total between both sides, but proved to be a deciding moment in the conflict between France and Britain over the fate of New France and influence the later creation of Canada. The battle lasted less than an hour, during which time tactics devised by the British commander, General James Wolfe, proved successful in breaking the column advance of French and Canadien troops under Louis-Joseph, Marquis de Montcalm. Both generals were mortally wounded during the battle; Wolfe died on the field and Montcalm passed away the next morning. 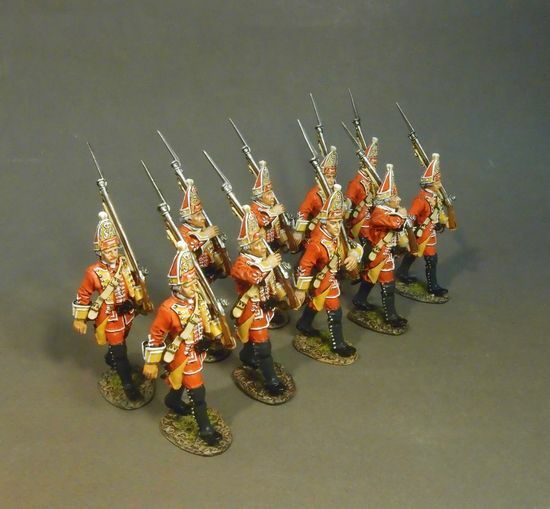 JJCLUB-SET#21 -- The Seven Years War, French Infantry, Regiment de Bearn, Officer with Colonel's Colour. Released September 2009. Limited Edition of 750. QB-046 -- Woodland Indian With Scalp! Released August 2009. Limited Edition of 750. Pre-Order Now! Please note for International Orders our "Reduced shipping promotion" is available. QBOAT-001 -- Quebeck Landing Barge, 13th September 1759. QBOAT-003 -- 15th Regiment of foot grenadiers. Released May 2011! Limited Edition of 750. QF-030 -- Regiment de Bearn, Officer and Drummer. QF-031 -- Regiment de Bearn, Officer.